February is generally associated with Valentine’s Day, but last year the Registrar at National Day Calendar declared February 23rd as National Tile Day. Perhaps tile as a gift may not be at the top of your list of romantic gestures, but designers and architects who work with tile know that it can be modest and sublime, as well as practical and seductive. The use of tile in architecture and design originated in ancient Mesopotamia. The artistry in the manufacture of tile was famously demonstrated by the Assyrians and Babylonians. Throughout the next few millennia, the Romans and Greeks led the way for China, Persia, India, Syria, Turkey and Tunisia to become leading developers of the art. With industrialization, tile began to be produced by machine, thus making tile more accessible to consumers. The first decorative tile trend in the United States was in the early 1800s with encaustic tile, ceramic tiles in which the pattern or figure on the surface is created with different colors of clay. Usually with two colors, but in some designs as many as six, encaustic tiles can be found throughout Europe; its entry to America began with a company called Minton’s Ltd., a pottery factory in Staffordshire, England. The production of decorative tiles in America began about 1870, thus ending the need to import expensive tiles from England. Encaustic tile began to lose its popularity after the turn of the century and was replaced by ornate glazed ceramic and mosaic tile. The Great Depression put the brakes on the tile industry altogether, as production became simplified with lower-cost linoleum, cork, rubber and hardwood floors. In the past two decades, however, tile has reached a new aesthetic height and is found not only in bathrooms, but in foyers, hallways, fireplaces, kitchens and exterior spaces. Consumers today have a plethora of choices when considering tile for their decorating needs. Ceramic tile: The most common tile used in the US, ceramic tile is composed of thin slabs of clay and other materials hardened by kiln firing, then coated with glaze. Ceramic tiles offer an infinite number of color combinations and its glazed finish resists stains, odors and dirt, cleaned up easily with standard household cleaners. Porcelain tile: A type of ceramic tile made from finer-grained clay, porcelain tile is fired at a higher temperature, making it dense, less porous and more resistant to stain and moisture, a perfect material for bathrooms. Terrazzo tile: A composite material made by setting chips of marble, quartz, granite or glass in concrete, terrazzo is then crushed, ground and polished until smooth, giving it a shiny appearance. The use of this tile derives from 18th-century Venetian pavement. With the invention of divider strips and the electric grinding machine in 1924, terrazzo became more durable, reliable and versatile allowing further design work within a floor. Popularized in the 1920’s Art Deco architecture era, a well-known example of terrazzo is the Hollywood Walk of Fame. 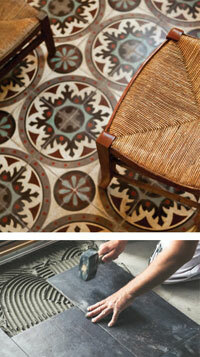 Encaustic tile: Made of two or more colors of clay inlaid together to create a pattern, encaustic tiles are then fired. This particular tile reached its apex in the mid -1800s when renowned maker, Minton’s Ltd., became the supplier of durable decorative finishes for walls and floors in churches, public buildings and grand palaces. Granite: Formed from igneous rock and, as such, has a distinctive appearance and surface which is impervious to scratching. Polished granite slabs and tiles are used in countertops, flooring and tile. Marble: The stone tiles have been used for centuries in homes to create a luxurious look with a distinctive and ageless, veiny appearance. Marble is porous, however and sealing the stone tiles is crucial. Travertine: A type of limestone with a crystallized appearance that comes in a variety of earthy tones. Travertine is soft and porous and costs less than other natural stone, a favorite surface for bathroom vanity tops, tub surrounds and flooring. Slate: A metamorphic rock which is extremely heavy and durable; it comes in dark and earthy colors and is growing in popularity due to its versatility. Slate has been a popular choice for flooring for hundreds of years. Quartzite: An extremely hard, metamorphic rock, quartzite is mined in large chunks and sawn into sleek slabs. The surface is polished and sealed for greater durability. Quartz, in comparison, is an engineered rock composed of 90 percent natural quartz granules and 10 percent polymer resins and color pigments. Both work well as countertops in kitchens and bathrooms. Trends in bathroom tile range from splashy to serene. Bold geometric tiles and graphic patterns add panache to any bathroom. Two emerging patterns in tile design are the hexagon and Moroccan fish scale designs. 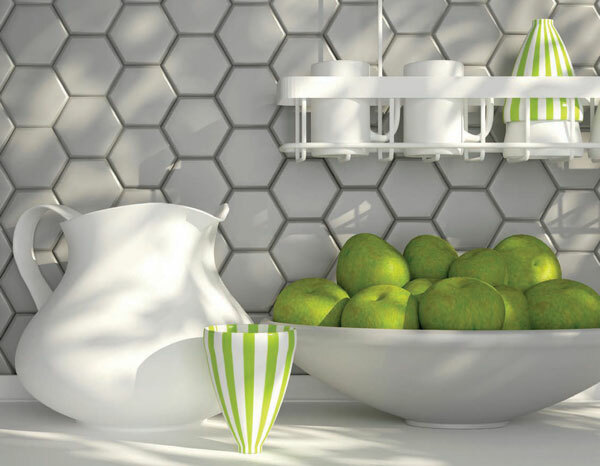 The hexagon tile (or honeycomb pattern) is enjoying a revival in larger sizes and colors and the fish scale pattern is trending in bathrooms with color schemes of green, blue and turquoise. Specialized tile design such as mosaics can be installed in just one feature wall (behind the sink or on the back wall of the shower tub). Tile mosaics come netted in roughly 12- by 12-inch sheets for easy application. Choosing one wall as a focal point gives a shot of style to a bath otherwise tiled with more basic and affordable tile. Since bathrooms have less square footage on floors than walls, it might be possible to splurge a bit on the floor design. A graphic, black-and-white basket-weave design, for example, can take a bathroom from basic to beautiful and a marble tile floor, counter or full floor-to-ceiling wall creates a classic, timeless look. The nature of marble, porous and soft, requires maintenance to avoid stains, scratches and moisture damage. Recent “deep ink” technology, however, gives a realistic, marble veining effect to man-made porcelain tile—an affordable alternative to natural stone that offers easy maintenance and exudes elegance. Quartz is another elegant choice for countertops and, as a composite, does not require sealing. For those who prefer more neutral tones or natural elements, Zellige tiles offer a beautiful and unique look; no two tiles are alike. Zellige tiles are glazed, colored terra-cotta tiles that originate in Morocco. Their shimmery nature makes them a popular choice for tone-on-tone showers, as the clay in the tile peeks through its rich glazes, adding depth and texture to a bathroom. Much smaller, colored, penny-sized round tiles can give small bathrooms more of a whimsical feel than of the standard, larger white tile alternative. Rounds work well for shower walls and floors and have been showing up in stylish bathrooms in recent years. Bathroom tiles need to withstand moisture and floor tile should not be slippery. Ideally, bathroom tiles are made of ceramic, porcelain or natural stone. Many modern kitchen designs are trending away from wall cabinetry, in favor of open shelving, with tiling installed all the way to the ceiling, creating a modern look. 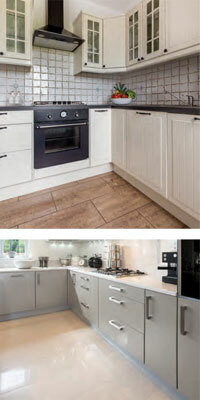 Neutral palettes remain popular, with grey, beige and cream as front-runners. In the kitchen, tile can be used on the floor, walls and backsplash. Floor tiles are designed to be durable due to the room’s heavy traffic. Backsplash and counter tiles function decoratively and can be laid of glass, porcelain and natural stone, standing up to kitchen grease and requiring little maintenance. With countertop as backdrop, the backsplash becomes an interesting focal point. With a neutral countertop, a patterned backsplash is an excellent option; chevron, herringbone, Moroccan fish scale and laser cut tile in geometric designs are a few creative options; Nonetheless, the kitchen backsplash is an integral part of any kitchen design. 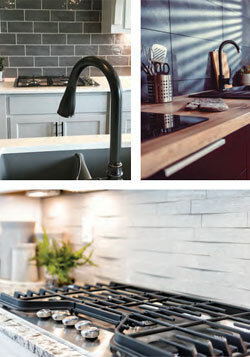 Over years, subway tile has remained a popular favorite, but may seem somewhat pedestrian in designs of late. Newer generations of subway tile depart from the traditional 3- by 6-inch standard, offering more colors, varying sizes and finishes that are beveled and domed. Subway tile has been a clear favorite throughout the years. However, it may seem somewhat pedestrian today. Paired with a contrasting grout color subway tile is suddenly elevated to an eye-catching reversal of the typical all-white standard. Other kitchen trends include Moorish tile which, like herringbone, makes for a beautiful backsplash. Large slab backsplashes are making their way into modern kitchens; instead of using many individual small tiles, one large slab of marble (or marble-looking tile), creates the backsplash in one stretch, with no grout to clean. Bigger seems to be better these days in flooring tile for the kitchen. It is not unusual to find tile in sizes upward of 24- by 48-inches; according to some designers, large format tiles and slabs are preferred options when it comes to developing open space. Large tiles make a room feel more substantial and less cramped. Fewer grout lines effect a smoother and sleeker finish. Sadly, largescale don’t work in small spaces. They are considerably more substantial than smaller tiles, can lead to implications with installation and should only be installed by professionals. Though marble, limestone and travertine remain classic floor tile choices, encaustic decorative tiles are now available in porcelain and are gaining popularity. 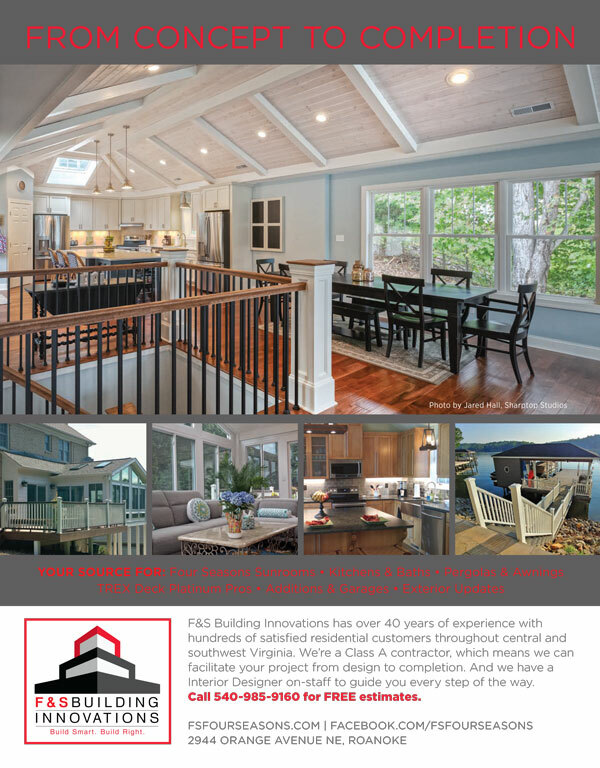 They offer a durable and less expensive alternative than the costly cement tiles created in the South of France in the late 1800s. The pattern or figure on an encaustic tile is not the result of glazing, but rather is created with use of varying colors of clay. Encaustic tile can make a big statement, configurable in many different ways; for example, encaustic tiles can be arranged to create a “carpet effect,” a welcoming and unique addition to an entryway. Floor tiling that replicates natural wood and stone has been tops in flooring trends for two years running. These porcelain tiles mimic the natural variations of salvaged wood planks and lend a rustic style. As with traditional hardwood floors, wood grain tile allows for creativity in pattern layout, from herringbone to chevron or parquet.